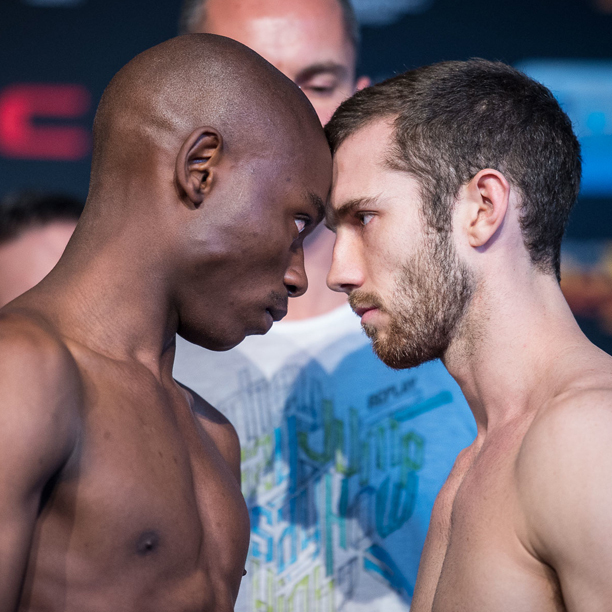 Durban, South Africa – The foyer at Durban ICC hosted the official EFC 43 weigh-in today. Headlined by the inaugural flyweight championship between the former bantamweight champion Nkazimulo ‘Zulu Boy’ Zulu and Durban’s Craig ‘Nemo’ Ninow, it was evident that the Durban crowd is fully behind their hometown hero. Tensions between the opposing camps became evident when Zulu and Ninow stood face-to-face for the final time before they clash in the Hexagon, with neither athlete wanting to be the first one to back down. “I’m putting my heart on the line and I’m keeping the belt in Durban,” Ninow proclaimed to the audience who cheered his every word. “The belt belongs in Johannesburg and I am taking it home,” responded Zulu, who beat Ninow via unanimous decision in their previous meeting in the bantamweight division. The encounter is best remembered for the devastating head kick that Zulu inflicted on Ninow, leaving him with a severely disfigured nose. For the first time in EFC history, female athletes will feature on the main card. Coming out to a thunderous applause, local favourite Amanda ‘Mad Dog’ Lino stood eye-to-eye with the ferocious femme fatale from France, Isabelle Pare in a catchweight bout. Lino is making her second appearance in EFC, after demolishing Stephanie Quaile in her debut. Pare is making her EFC debut. Also featuring on the main card is Warren Allison, who faces Rafal Haratyk in a number one contender fight in the middleweight division and Durban favourite Wesley Hawkey, who meets the ever-dangerous Sizwe Mnikathi in the featherweight division. Three athletes initially failed to not make weight. Tyrel Singh, Tshilumba Mulumba and Baldwin Mdlalose opted to take a purse penalty. EFC 43: Ninow vs. Zulu, presented by BetXchange.com, and takes place at Durban ICC, on Saturday 27 August 2015. Tickets available at www.computicket.com.